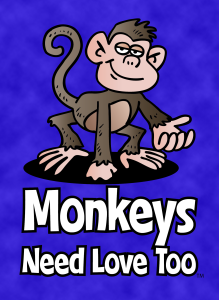 Monkeys Need Love Too is a game designed by Will Stateczny, published by Topwise Games. It is for 2-6 players. In this game, players are animal rights activists that are working together to break out all the lab monkeys from a local perfume test lab. That all changes one the experimental beaker of Competitive Edge cologne gets knocked over, thus altering everyone’s mind set. Now everyone is in competition to free the most monkeys. The player that does this will be declared the winner. To begin, the 10 banana cards with a light blue card back are placed face up in a pile in the center of the table. The Flinging Poo deck and the To the Trees deck are separated and then shuffled. The To the Trees deck is set aside face down for the time being. Play now begins. The game consists of 2 phases, the Flinging Poo phase and the To the Trees phase. The first phase is the Flinging Poo phase. On a player’s turn, they will perform 4 steps in order. The first step is to draw until they have 5 cards in their hand. If a banana card is drawn it is added to the player’s backpack of bananas by placing the card face up on the table in front of them. The player then draws again. 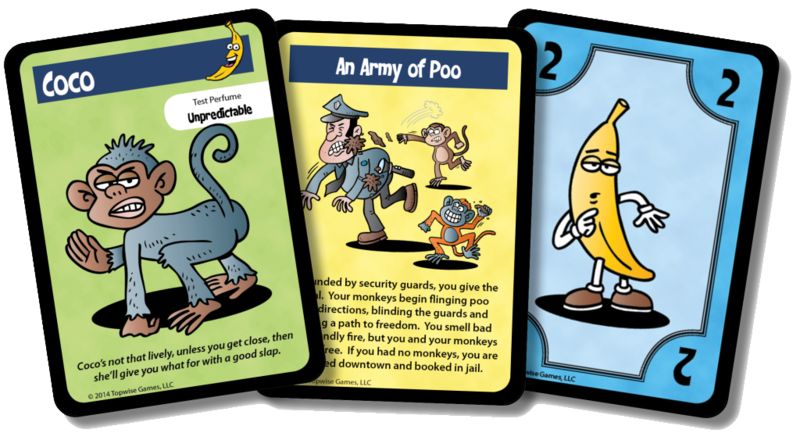 The second step is for the player to play a monkey card and an action card from their hand. Only a monkey face up in front of a player can be freed later on. The third step is for the player to feed all their monkeys. This is done with the banana cards that were placed face up earlier. If a player can not feed a monkey then that monkey card is discarded. The fourth and final step allows the player to discard any cards that they do not wish to keep. This ends the player’s turn and play then shifts to the next player who goes through the same 4 steps. This all continues back and forth until the No Coco, No!!! card is played, thus ending the Flinging Poo phase of the game. There is also one extra action that may be performed by a player at any point during the Flinging Poo phase of the game. The player may eat 2 of their bananas which then allows them to throw the peel at another player. That player then has to roll 2 dice, trying not to roll doubles. If they do, they have slipped on a banana peel and are knocked unconscious for their next turn. Players can eat no more than 12 bananas or be forced to roll a die for each extra pair of bananas eaten. If they roll anything but a 6 they lose consciousness and thus their next turn. The next phase is the To the Trees phase. In this phase, players will draw a card from the To the Trees deck to see if they were able to save their monkeys or not. Once all the players have drawn their cards, the game is over. That is unless one of the players was able to play a False Alarm card. If so, the Flinging Poo phase is restarted. Players still in the lab retain all of their cards. Those players that escaped can choose to come back inside and try to free more monkeys, losing the ones that they previously had, or they can stay outside and try to set off the alarm again by throwing rocks. This is done with a roll of the dice for the player and their monkeys. This can possibly set off the alarm or even knock the player unconscious. If a player was caught while trying to escape, they will lose everything but their banana cards. To bribe the jailer they must pay 2 times the number of players. Once this is done, they can rejoin the other players back in the lab. Once the final phase is completed and there are no False Alarms, the game is over. Players check and see how many monkeys they were able to free. The player with the most monkeys wins. The main components in this game are the decks of cards. They are really well done and have some very humorous artwork on them. The art reminds me of games like Munchkin and Fluxx. The cards are easily shuffled and played with. They are very nice. Also included with the game is a pair of regular dice. They look nice as well and roll very easily. I really like the artwork and find that there is a lot of great humor and silliness in the design. I’m very happy with the production quality of the game. The rule book is a black and white sheet of tri-folded paper. It has some of the monkey images on it. Everything is explained really well and is easy to read. There’s nothing that is difficult to understand. I only wish that the rules had been in color with some examples of play. Not that you really need all that to understand the basics of the game, it just would have been nice. The game is really easy to play. It’s definitely got a lot of humor with a take that feel to play. It’s very light hearted and doesn’t take a long time to play. The only thing that I found unwieldy was the lengthiness of the text on some of the cards. For younger kids playing the game this might be a bit difficult. I think I would have liked it better with shorter text. Other than that the game really flows well without a lot of lag time between player’s turns. I’m fairly happy with the overall gameplay. It is very chaotic and as I said earlier feels a lot like Munchkin to me. Monkeys Need Love Too is a light game of saving monkeys, throwing bananas and trying to stay conscious. The light hearted humor and design of the cards will make you laugh. Fans of games like Munchkin and Fluxx will most likely enjoy this game. It’s a fairly simple game to learn and it doesn’t take a long time to play. Players that really like the take that mechanic will get a kick out of this game. I recommend this game and think everyone should give it a try. For more information about this game, please check out Topwise Games at their site. You can also back the game right now over on Kickstarter. This entry was posted in Reviews and tagged board, board games, card, card games, games, love, monkeys, monkeys need love too, need, stateczny, too, topwise, topwise games, will, will stateczny. Bookmark the permalink.